Announcements of Editing, Serials, and Patreon! I mentioned around the middle of June that I was planning some big changes, and here they are! The first change is my first novel, Slubes, will no longer be available through Createspace and Amazon.com. I’m sure you’ve heard about Amazon using jerk tactics to get better deals from companies that inevitably hurt writers. So I’ve been looking around for somewhere better. I’m considering Lulu.com, though I haven’t totally decided yet. However, in the meantime, Slubes is getting a makeover. I’m getting a professional editor to help me make Slubes, well, better. Wait, no. Amazing! I currently have no estimate for completion of that. I have decided to get a Patreon account to go along with my writing and to help me out. Patreon is a website where fans of creators–authors, cartoonists, musicians, whatever–can become patrons and pledge money per month or per work. The idea is a little give and take: the creators make something and put it on the internet, the fans give them money, and then the creators make more stuff–patrons can get rewards for pledging, and milestone goals give them something to work towards. In my case, it’s per chapter (or short story)–every time I post a part from a story, I’ll receive the money from my patrons. Since I’m trying to aim for a per-month basis, this would basically be per month, but as it’s per chapter it’s not set in stone. Patrons can also receive rewards depending on amount given: $1 per chapter lets you see my Patreon activity stream (which I’ll use to post updates and secret information) and also gets you a coupon for the e-book of my latest novel (you’ll be put on a waiting list if you pledge before the second edition of Slubes is out); $5 gives you access to a live video stream I’ll do each month where I read from my novels and short stories–including the possibility of some I haven’t released yet–and take questions from people watching; $9 gets you a free signed physical copy of my latest novel (like the e-book one, you’ll be put on a list before Slubes is out); finally, there’s a $100 reward that I don’t expect anyone to go for. But hey, it’s there if you really like my writing and have extra money. The milestone goals I have begin when I’m getting $50 per chapter, at which point I’ll give this site a bit of an overhaul with a WordPress premium account, letting me add custom fonts and colors and get a proper web address and remove ads; at $100 per chapter I’ll try to post a bonus chapter/short story each month without applying it to patrons’ pledges (so that you don’t suddenly give twice as much per month as before); after $250 per chapter I’ll begin writing a (planned monthly) comic where characters in the Cloudy Cuckoo Cosmos answer e-mails sent by real people on Earth, drawn by a talented artist (i.e. 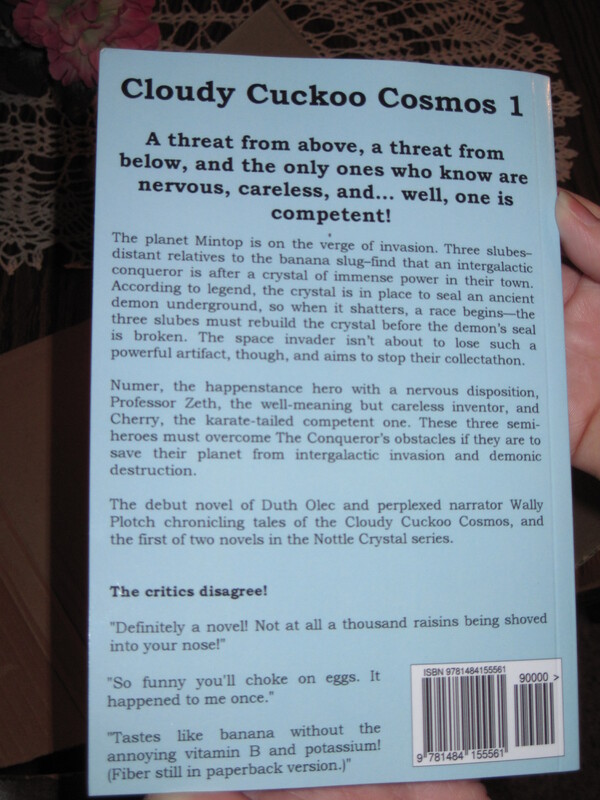 not me); finally (for now), at $500 per chapter I will consider everyone awesome, have to think of more milestone goals, and begin work planning an online Cloudy Cuckoo Cosmos text tabletop-type role-playing game, the details of which are long and complex, but more information will come up if we begin to near this goal. As I said, I don’t have a projection for when Slubes Edition 2: Professional Editor Ahoy will be done, but at the beginning of each month I’ll be posting online (for free!!) here the next part of Slubes. The entirety of Day 1 (which was previously up as a free preview) is up now in two parts (as is the short story Tough as Blades), and at my projected schedule, Slubes will be all posted on here as of March 2015, so Darmenzi will begin being posted April 2015. 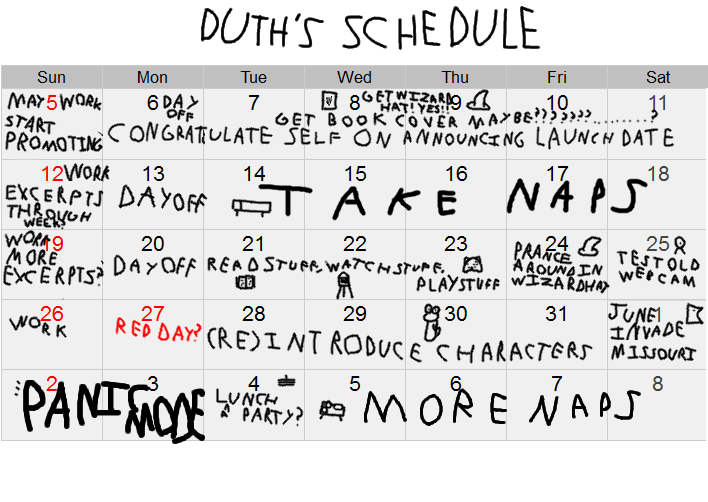 It would be nice to have Slubes finished (for reals this time) by then, so I’ll go with by next March as my goal-date. I think that’s everything that’s happening coming up. I’ll keep everyone posted on what’s going on. Seriously. Everyone. I will break into the homes of the entire world populace and leave letters on what I’m doing. I will then eat your milk and drink your cookies and fly off on a reindeer-powered chimney. HO-DE-DO, VERY IFFMAST! Remember that stream I mentioned a few days ago?? The stream is up on Youtube now! Watch as I awkwardly try to speak above the buzzing of my microphone, causing me to breathe loudly and into the mic and turn into a hurricane! Good morning! Or afternoon! Wait, wait… good noon! 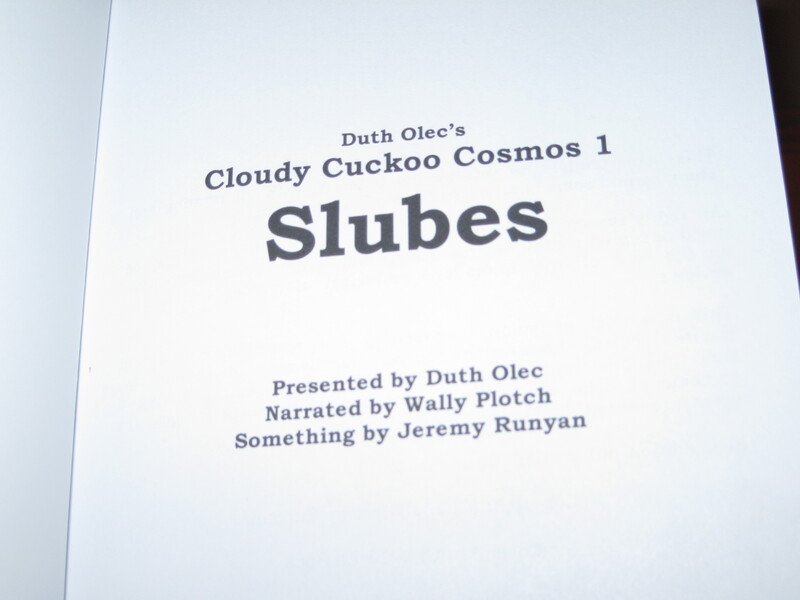 The… um, Kindle version of Slubes is now available on Amazon. Over the next week I’ll be looking into having it available elsewhere (I’ve heard of Smashwords as a place, so, maybe), although as I’ve made my preference for the physical copy clear I won’t be making a big deal of it. I also have an author page on Amazon now, although since you’re here at my blog there won’t be much there besides all the books (all one book) available at one place. As a reminder, here’s the page for the paperback copy. And by reminder, I mean I edited last night’s post after the page went up in less than an hour. This is possibly because, as it turns out, I accidentally made them available early–about a week early for the paperback and 2 weeks early for the ebook! Ha ha ha ha I panicked more than I should have. Anyhowzit, I just got up and my mouth feels like a swamp cave, so I’m gonna go do some stuff, then get back to this with posting a new Character Profile. After that I have some updating to do around the place. My first novel is now available for purchase! 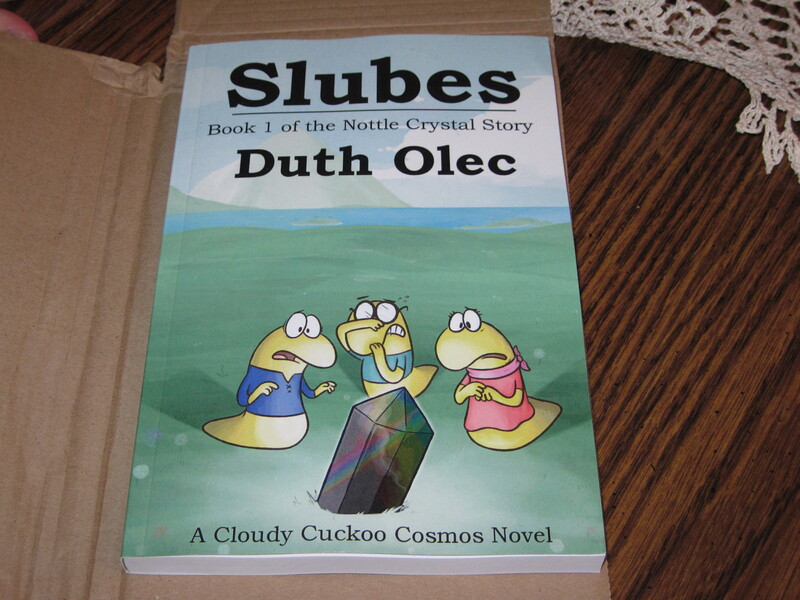 My first novel, Slubes, is now available on the Createspace store! This is it, folks! I have crossed the threshold! I’ve jumped the gorge and am on the other side! I get to tell people that I wrote a novel, and that it has been published, no matter how self that may be! It’s getting late–although not as late as late was last night, I have to say–and I want to be up at a decent time tomorrow–unlike today–so this is about all I will say on it now, but don’t forget I do still have a raffle going, so a couple free copies are still up for grabs! Later I will have a new character profile, and tonight at 18 Eastern Standard time I will have a stream where I’ll read from and talk of the novel. “My new novel, Slubes, comes out on June 4th. In celebration of this literary event, I’m going to have a stream launch party thingamajiggy. I’ll just do some talking, read from the book, and answer questions people pose. Although I’ll give focus on questions about my novel and writing, if you want to ask stupid questions, well, I just may answer those too. The novel will be available on Createspace, a link to which I will add to the bottom here once it is available, and will be available on Amazon.com soon after, while a cheaper ebook version will also be available around the same time. I just realized I think I forgot to mention the time of the stream. I knew I’d forget something. Well, it’ll be 18:00 Eastern Standard Time, which is 7:00 Eastern DST, 6 Central, 5 Mountain, 4 Pacific, 3-8 going backwards all other times in the world. I’ll probably have another video announcing it an hour or so before it starts, something simpler than actually recording myself. June 4th: Novel Release. Aaaa. WAIT WHAT yes, I’ve decided! The time is now… to say when the time will be! In one month, on the fourth of June…ly? 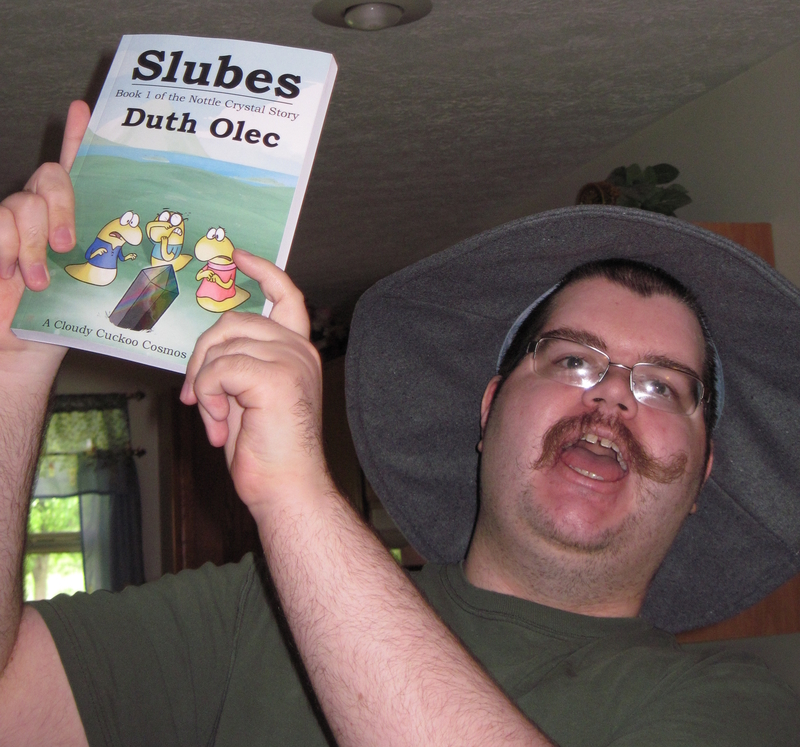 No, just June, my novel, Slubes, will be made available through Createspace in both paperback and cheapo e-book format! Cheap for you, that is, not for me, well, I don’t particularly have to pay anything for either format, but the e-book will be cheaper in both cost and experience. At least, that’s how it seems to me, I’ven’t actually read an e-book before but the limited amount of control the author gets, um, I, am, getting off-track. Let me start over. As you can see, I will begin promoting Slubes this coming week, however it may be that I will do that. I will probably really get into it once I have the completed cover for it, but the guy drawing it said it shouldn’t be too much longer. In the meantime I have a lot of self-congratulatory business to do. The couple weeks after that will continue this, but I’ll also get some excerpts from the novel to post here. 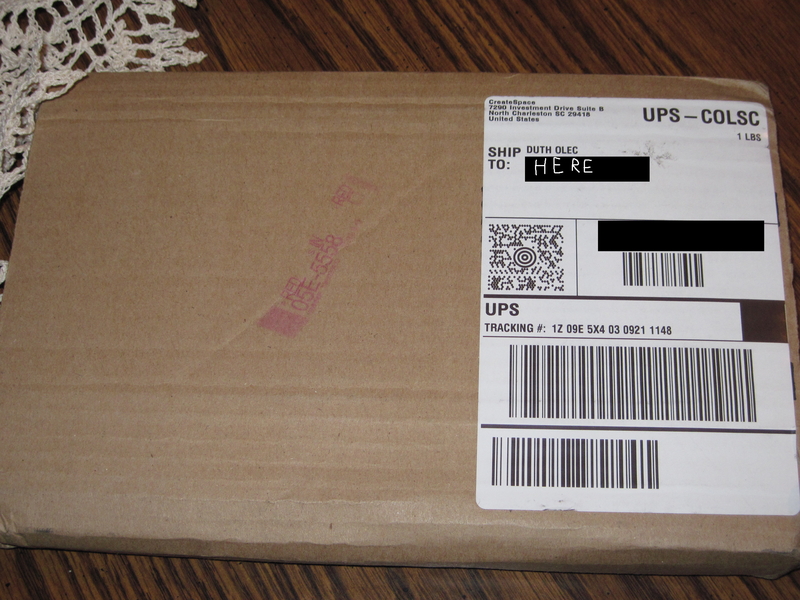 I’ll also have to test an old webcam we have, it’s probably about 8 years old and I have no idea if it even still works. The reasoning for this is I’ll probably have an online lunch I mean launch party when my book comes out. But first I have to make sure I have a working device to record me onto the streamernetiverse or whatever. A week before the novel comes out I’ll probably start going more in-depth with the characters, and then June 4th will probably be the release party, again if I have a device capable of letting me do that. All dates subject to me saying hex with it, more naps.